Looking for private in-home or in-studio Broadway Singing lessons? Our Flushing teachers are ready to get you started. Find your teacher today! Check out some of our most popular teachers near Flushing, NY including New York, Brooklyn, Bronx, Jersey City and Astoria. Broadway is more vocally and stylistically demanding today than it has ever been. Musicals like A Gentleman's Guide To Love & Murder, Chicago, Wicked and Rent all require the singer/actor to have the vocal versatility to audition for as many roles as possible. Whether you’re a seasoned professional singer/actor looking to expand your repertoire, or an amateur singer/actor who wants to sing more effectively, studying with Ms. Christine will give you an understanding of Broadway Singing. My course will develop your technique and skills in Broadway singing so that you'll be comfortable with almost any audition you may encounter. Whether you are interested to sing in a belt, mix, head, chest voice or all of the above, I can help you! By using well-thought scaffolding methods, based on research, experience, and clinical training my students are given the opportunity to project their voice in a healthy manner and with an extensive vocal range up to five octaves. I train students and professionals for all types of auditions and performances. I believe that progressive teaching must employ constructive pedagogical strategies to foster meaningful musical experiences for students to build and to exhibit competence. My pedagogical model is comprised of a student-centered approach to produce attainable challenges and to affect affirmative changes that will physically, technically, and emotionally enrich each student's performance. During instruction, I exercise scaffolding methods to facilitate the students' zone of proximal development and innovative questioning to augment students' cognitive thinking and critical thinking skills. The process of musical learning is purposeful when it is facilitated within a nurturing environment to motivate the students' intrinsic interests and that is my goal! n Broadway and off-Broadway productions, CCM Singing Competitions, Commercials, Musical Theatre Productions, The Voice, X-Factor, American Idol, Specialized Performance Schools, College Music Performances, and Choirs. A number of my piano students prepare for the NYSSMA and ABRSM examinations. As a clinical trained Vocologist, I also work with students to correct vocal fold injuries and to prevent further trauma, as well to improve phonatory production during singing. As a music professional, I specialize in Voice (Contemporary Commercial Music), Vocology, and in Piano (Classical). I am certified by the New York Singer Teachers Association and the Somatic Voicework The LoVetri Method. In addition, I am a City/State Teacher Certified in Music (K-12) and a member of NYSTA, NATS, and MEANYC. I am a graduate of Columbia University in Music & Music Education, M.A., Ed.M. I have a comprehensive background and training in Piano, Voice, Vocal Pedagogy, Vocology, and General Music. I studied music at Hunter College and I obtained a Bachelor Degree in Italian from Queens College. As an instrumentalist, I attended Fiorello LaGuardia of Music & Art & Performing Arts H.S. and the Center for Preparatory Studies in Music at Queens College. My professional development is comprised of studies in Vocology at Keidar Voice Instititute, in Voice Management Techniques at Westminster Choir College, and in Dalcroze at Lucy Moses School. Over the years, I studied with acclaimed vocal professionals such as Dr. Anat Keidar, Dr. Jeanne Goffi-Fynn, and David Sabella-Mills among others. My pedagogical model is designed to benefit students' aspirations and strengths in voice and piano. The outcomes are based on each individual's commitment to the process. Fay is an amazing teacher that gives her student's the ability to progress and I can't even begin to describe how much I've improved because of her help. An amazing teacher that helps you progress as a performer. Piano has been such a fun instrument to play and amazing considering the techniques taught by her! Her lessons are so fun as well as educational. Fay is such an amazing teacher! I got into Fiorello H. LaGuardia High School thanks to her. Best Teacher I've had, she helps train your voice and goes through the vocal anatomy so you understand techniques such as proper breathing, posture, coordination, grounding, acting, diction...etc. I've been her student for about a year three years now and I have to say that my voice has improved so much as a performer all thanks to her! If you get the chance, at least take a class, you will not regret it! I am an award winning Off-Broadway composer, actor, and director with over fifteen years of experience both onstage and behind the casting table. I studied at Towson University where I got my undergraduate degree with a specialty in Musical Theatre. I have been teaching for over ten years and have students performing on Broadway and in National Tours, as well as younger students successfully completing high school and college entry auditions. Private coachings are available for both voice and acting technique. 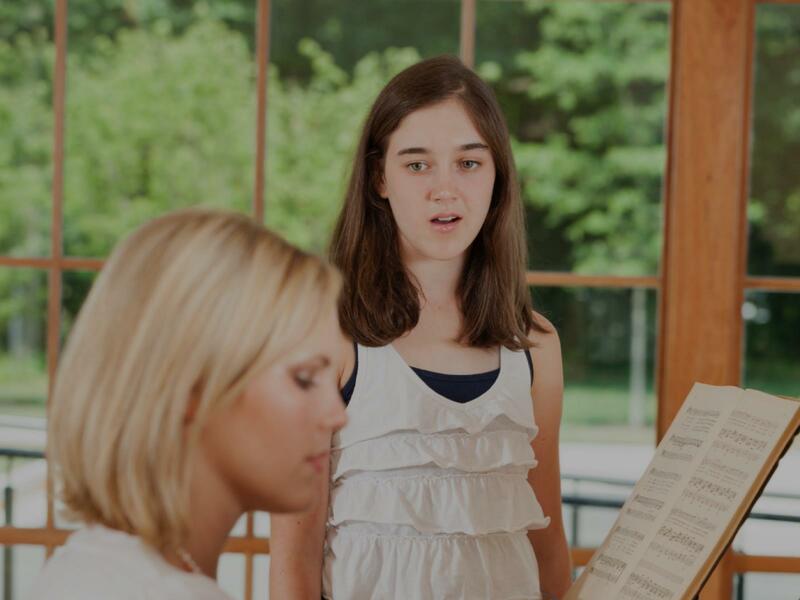 In voice lessons, we focus on forming a strong foundation in vocal technique, preparing for auditions and callbacks, and building a repertoire book that shows off the singer. Each lesson is tailored specifically to the student's need and ability in order to get the most out of the session. Rep Coaching is also available upon request. And, above all, I strive to cultivate a safe environment where the student, be they beginner or professional, can express themselves freely and grow as a performer. Kristen is such an incredible coach. She prepped me for a Broadway audition and I made it into final callbacks! She really made my audition pop and made me feel so much more comfortable going into that room. I have been a professional singer and teacher for many years. I help my students build their instrument and strengthen their voice. We also will take the time to find appropriate repertoire and characterization. Acting coaching, as well as technique and stylistic interpretation. Discuss different singing styles and what fits the music best. With experience in Alexander technique, dancing, and vocal pedagogy you can be assured that your voice and body will be free and open. I've been teaching professionally for 11 years, I pride myself on creating a good foundation for beginning vocalists and allowing them to learn the way that is best for them. Students of mine have been successful at getting into college music programs and being recognized at theater festivals. VOICE FOR SINGERS & ACTORS: You'll learn sequential detailed exercises that free and strengthen your voice. You'll understand how your instrument works, what parts of your voice are blocked and what to do about that. You'll be able to combine your emotional life on your voice without tension and blockages. You'll learn how to approach and perform scripts, text and songs in preparation for audition and performance. And, you'll experience the JOY of using your voice. re Company to jazz artists to Broadway singers and actors. Can't find a teacher in Flushing, NY? get compliments on Caroline's progress all of the time. Marcelle helps Caroline with Nysma and helps her to work on music for any school performances she has. Caroline has also gotten very far on "The Voice".... hopefully the finals soon, thanks to Marcell's great teaching :) Marcelle has an awesome voice and is a great piano player. Her studio in Forest Hills is in a convenient location." , what a difference! This was just what I wanted....so happy with my lessons." New York, NY teacher: Christine G.
New York, NY teacher: Paula S.
"Matt was kind, supportive and knowledgeable! He was fantastic!" d the confidence to keep growing. I was lucky to have her!" New York, NY teacher: Shelley M.
nd very trustworthy to work with. I would highly recommend her." New York, NY teacher: Katie B.
ant a teacher that is serious all the time, although she can get serious when needed. A really good person to work with, in general great! I truly love her teaching and her dedication to students." New York, NY teacher: Barbee M.